No, I can’t speak Finnish either. Thank heavens Finland’s population is progressive and most of them can speak English, because I’m about to fly off to the other side of the world to share Alaska with our friends abroad. The question of “Who Owns the Stories?” will be the subject for several public presentations and round-table talks. 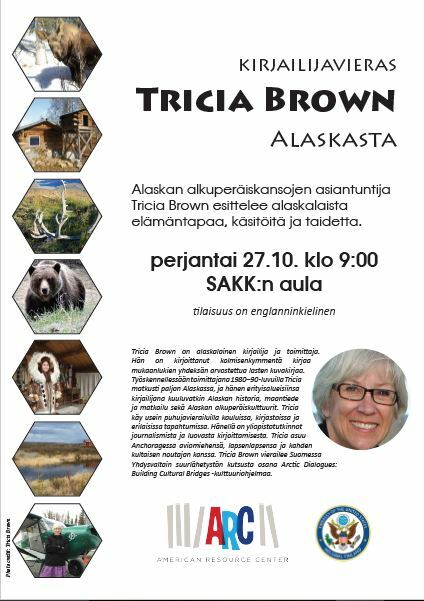 While Finland is working to create a handbook of ethical standards to protect the misuse or misappropriation of indigenous stories and legends, we in Alaska count on the ethics and sensitivities of writers, illustrators, and publishers, most of whom are non-Native. Blunders occur at the expense of the Alaska Native cultures and the individuals who truly can define ownership . . . or can they? Even within individual cultures, rights to stories and other artistic expression can be a thorny topic. Talking about it is important. Listening is even more important. My hope is to encourage more Native Alaskans to write and illustrate their own stories. It’s happening, but successes are just beginning to build. Aliy Zirkle reads “The Itchy Little Musk Ox” to a batch of kinders in the Golovin school. As she travels, Aliy is delivering stickers, stuffed toys, and books to each school, too. Kids from kindergarten to high school are getting a batch of great stories written by Alaskan authors. No surprise, many of them are about mushing! And no surprise, because I coordinated the book selection, many of the represented authors are members of the Society of Children’s Books Writers & Illustrators, Alaska chapter. Warm thanks to award-winning author Don Rearden, who donated multiple copies of his two excellent books, The Raven’s Gift, and Never Quit! Those are for the high-schoolers. I’m just so proud of Aliy’s intentions–building up the kids and using her celebrity to promote good things in Bush Alaska. Way to go, Aliy! This sweet Patsy Ann lookalike visited me at the Saturday Market. See the heart over her eye? Me and my colleague, Jen Funk Weber. I’ve teamed up with fellow members of the SCBWI (in English, that’s the Society of Children’s Books Writers & Illustrators) to meet our readers at the Saturday Market in downtown Anchorage. It’s not a weekly commitment, and our participation is weather dependent (books and rain don’t mix), but it’s been great chatting with folks, many of whom are either starting or finishing their trip of a lifetime. The world comes to Anchorage in the summer. Anyway, come down for the shopping, food booths, and live entertainment on weekends, and look for the SCBWI booth on Moose Hollow! We’ll be there on Saturday, July 22, from 10 a.m. to 6 p.m. with lots of books. And if you want to know how to join our organization, please stop in. 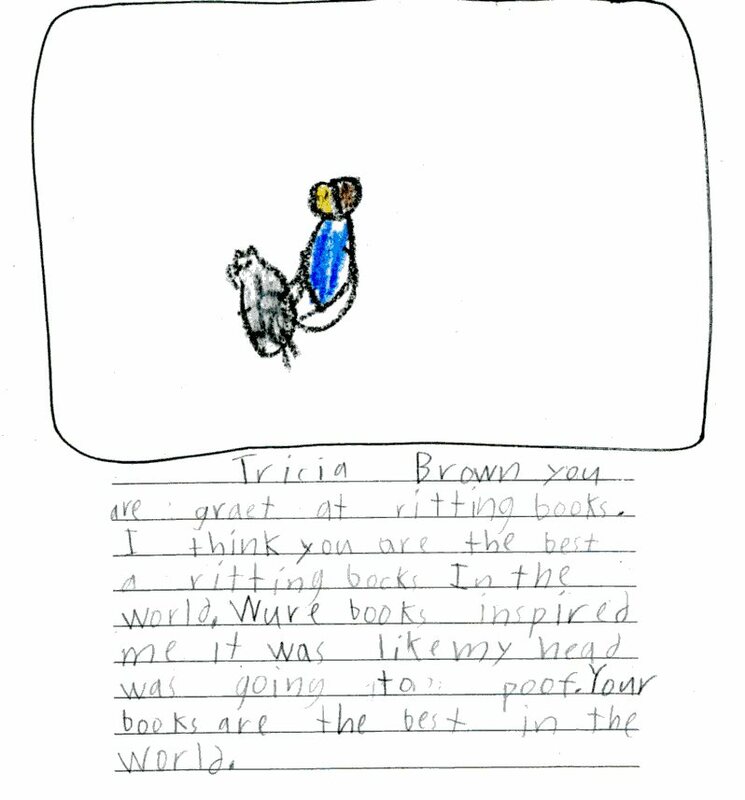 To view the many, many books written and/or illustrated by our Alaskan members, click here. 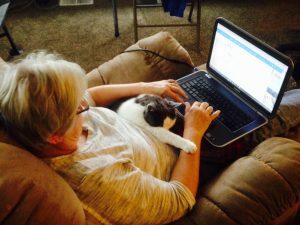 What is it about cats and keyboards? Whether it’s trying to meet a deadline or just paying bills and answering emails, there’s always furry someone in the way. You, too? We lost my sweet kitty Zach this winter and now what I wouldn’t give to have him distracting me again. Still, there are a pair of golden retrievers here who make frequent demands. Somehow I get some work done. These days, I’ve got a couple of ongoing projects. I’m currently writing the text for a book by the official Iditarod photographer, Jeff Schultz. Watch for that before Christmas. Icons of the Iditarod will be a visually gorgeous tribute to the mushers, dogs, volunteers, traditions, and places that have made the Iditarod Trail Sled Dog Race great since its first running in 1973. Also, for those of you who know our classic book, Children of the Midnight Sun, photographer Roy Corral and I working on a second edition for 2019 with ten new kids, each one representing his or her Native Alaskan culture. I love flying into remote villages to meet them and their families. So far, I’ve been out to the first three villages on my list. Seven more to go! So stay tuned. And finally, beginning tomorrow, May 27, this summer you’ll find me with a table-load of my books (for adults as well as the children’s book) at the Saturday Market in downtown Anchorage. 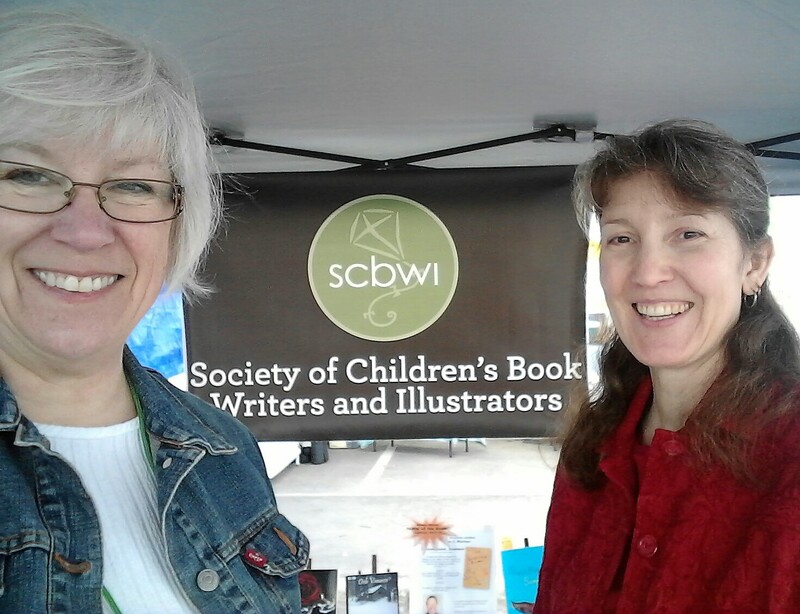 Look for the SCBWI booth (Society of Children’s Books Writers and Illustrators) at 3rd and E Streets on the bluff above the Alaska Railroad terminal. It’ll be an every-other-Saturday affair for me, so I can grab some weekends off during these rare summer days. As I write, we have more than 19 hours of daylight and gaining about five minutes a day. Another distraction when I should be writing. Ms. Tanc’s students in Romania learned some Inupiaq Eskimo words before I shared Charlie and the Blanket Toss with them on Skype. Our time together made the newspapers in their city. As March wrapped up, so did my sixty-day commitment to Skyping with classrooms all across the country (and the world). During February and March, I spent most weekday mornings with three to five appointments that teachers had booked through Microsoft in Education’s guest-speaker program. They chose one of three titles offered on my profile: Bobbie the Wonder Dog, Charlie and the Blanket Toss, The Itchy Little Musk Ox, or I could talk about the Iditarod for older students. Using the “share screen” function, I showed them a Powerpoint presentation and/or a Windows Movie of the illustrations from each book as I read. Occasional evening appointments on Alaska time translated to mornings (the next day) on the other side of the world. So I stayed up late to read to English-speaking students in Greece, Qtar, Kuwait, Sri Lanka, England, Egypt, India, Japan, Taiwan, the Philippines, and Romania . . . all from my cozy little office with a stinky dog sleeping nearby. The grand total: 108 Skype visits. 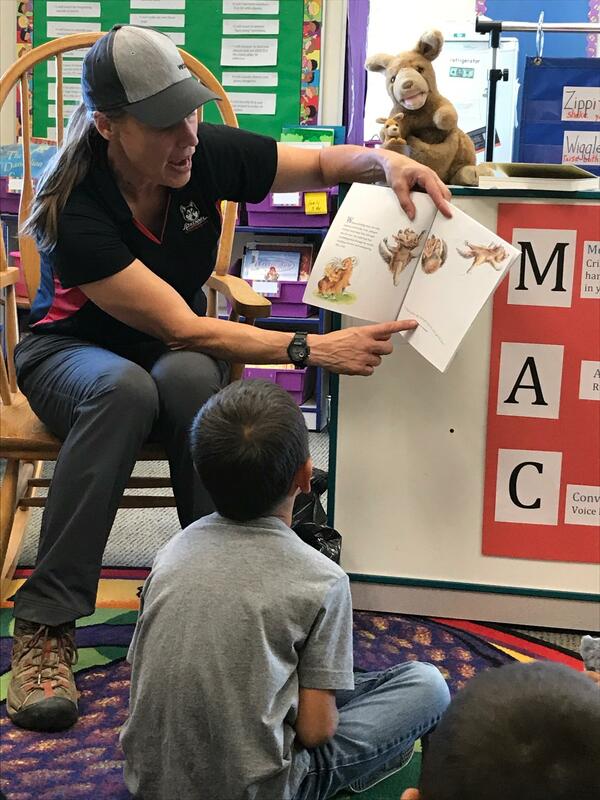 It was incredibly satisfying to read to kids and encourage them to read, write, and explore other creative expressions. By far, the overseas classrooms asked me to read Charlie and the Blanket Toss. At times it hit me, the significance of this transformative technology. There I was, this white lady in the sub-Arctic, clicking through a Powerpoint presentation and teaching Filipino kids how to pronounce Inupiaq Eskimo words. Really. I came away with an even greater respect for committed teachers and their profession as a whole. And while I fielded lots of questions about Alaska and Bobbie the Wonder Dog and musk oxen babies, the most-asked questions were: 1. “Do YOU have any dogs?” and 2. “Can we see them?” Then I would crank the laptop around to one of these two golden retrievers, Kvichak or Willow, hear the loud “AWWWWW!” and know that they now hold superstar dog ranking. And before the end of each session, I walked my laptop to the window and showed the kids all that deep snow in the front yard. Blew some minds there. I’ll be back again next year to Skype during February and March, the months that celebrate world literacy and Read Aloud Day. Until then, I’ll continue to visit schools and libraries in person, so if you’re interested, just let me know. In the meantime, Quyanaq to all you wonderful teachers who invited me into your classrooms! 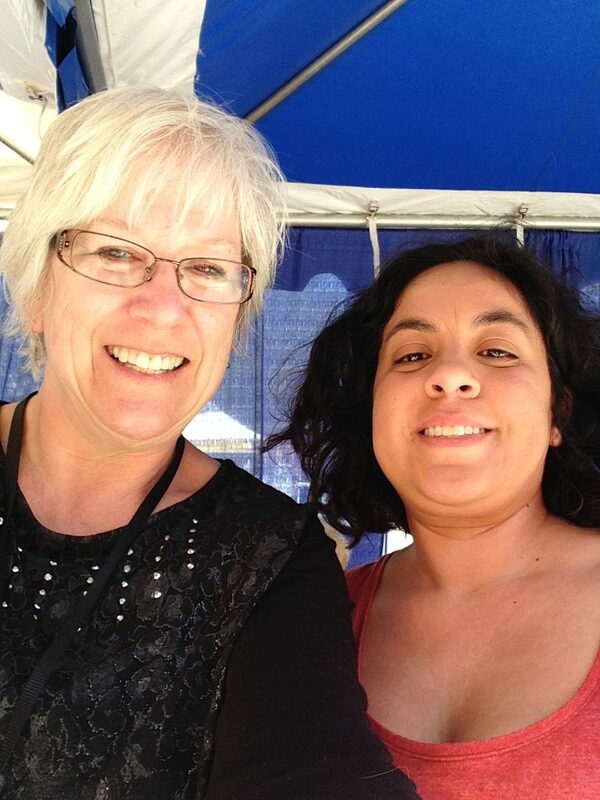 In February, I Skyped with Mrs. D and her students in Phoenix, and then she surprised me, driving for hours to see me at the Tucson Festival of Books in March. She said this selfie would prove to her students that we’d met! World Read Aloud Day 2017 is here! I crossed several time zones to meet with Ms. Matheny’s class! February 16 is an important day all across the country–and the world! 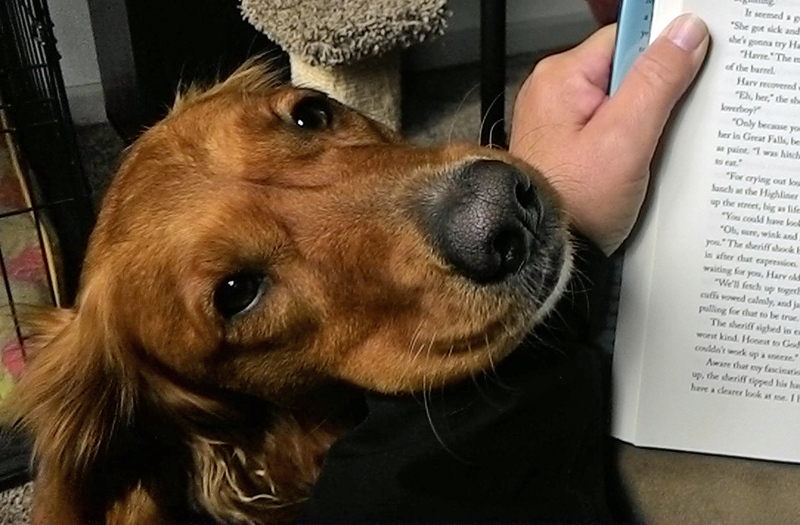 This day in February is dedicated to the act of reading to somebody (or maybe even a pet). 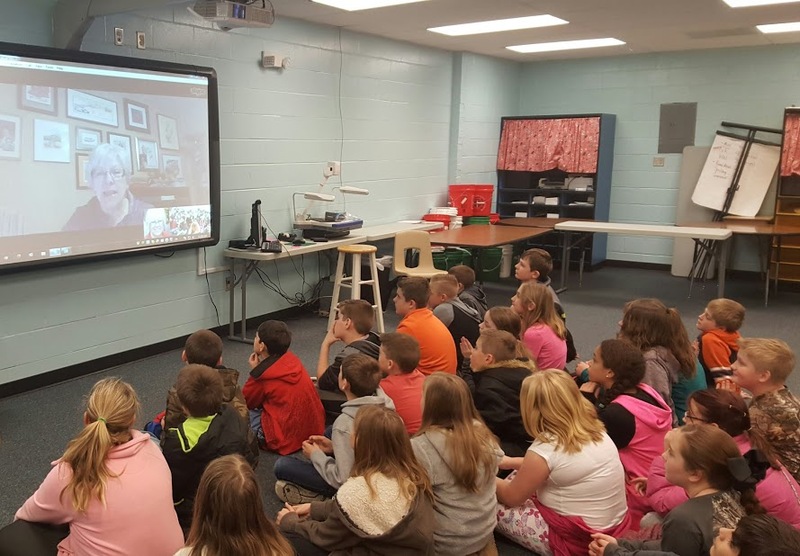 I’ve been doing my part during February and March by Skyping with classrooms throughout the U.S.–and then there’s Japan, India, China, Kuwait, Sri Lanka, and Ghana. And all without a passport. I just love Skype! Tomorrow, I start with a visit to Nunaka Valley Elementary for their “Wake Up to Literacy!” morning. Afterward, I have back-to-back Skype sessions with New York, Wisconsin, and Canada. Even if you’re not an author reading to students, you can participate. Click here to connect with the Children’s Book Council’s packet for how you can get involved. And in the meantime, read to your furry family members. You know they love it! Read that part again, okay? I shot this photo yesterday when I was flying back into Anchorage’s Merrill Field in a Cessna Caravan. I’d been out in Prince William Sound, visiting the village of Chenega Bay. My part of Alaska has been in the grip of deep cold for about a week. Now, you realize that Alaska is one-fifth the size of all of the Lower 48 states combined. So when I say “my part,” that’s only Southcentral Alaska, which usually doesn’t see below-zero temps in the winter. So a string of -5 to -10 days gives us room to whine. But not too loudly. 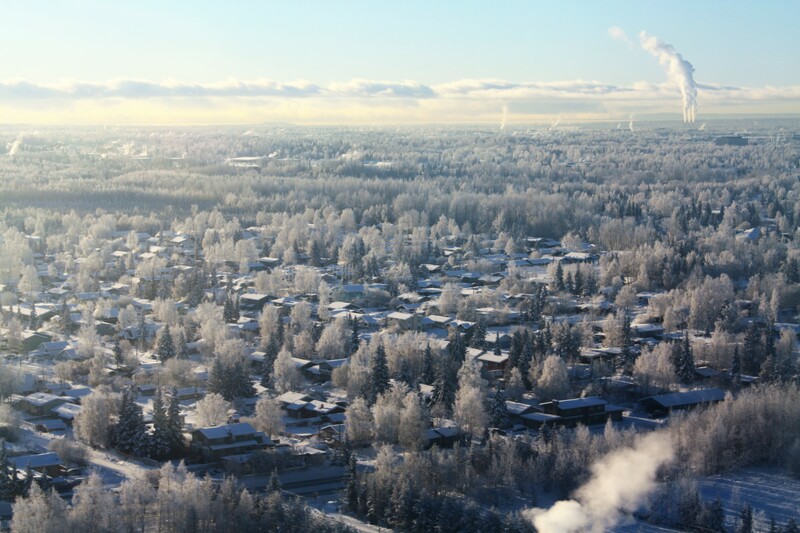 You see, our friends in Fairbanks are shuffling around in -40 to -50F. And I heard this morning that Kobuk, Alaska, measured -59F. That shut me up. All this said, I’m projecting to March 11-12, when I’ll be in ARIZONA (woo-hoo!!!) for the Tucson Festival of Books at the University of Arizona campus. 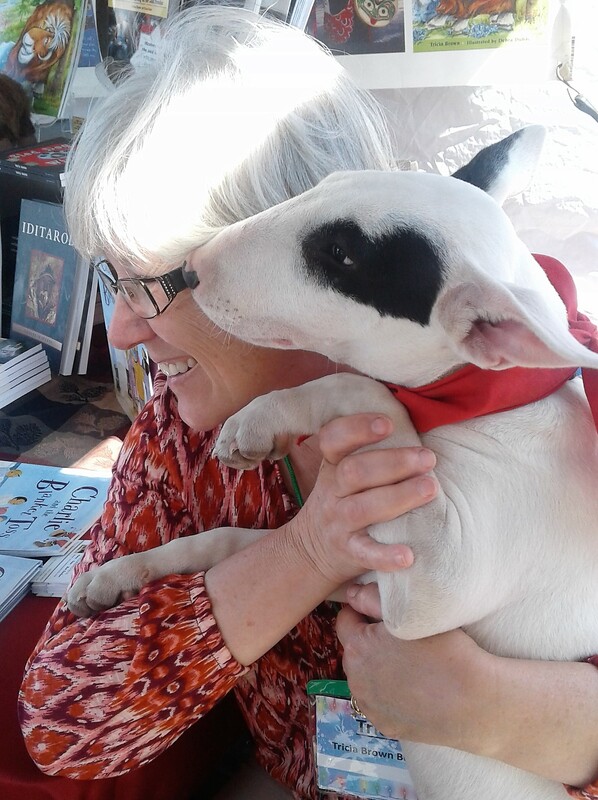 I’ll be at the Author’s Pavilion on Saturday, March 11, from 12:15 to 2:15 p.m., signing copies of Bobbie the Wonder Dog and ZIG the Warrior Princess. And perhaps best of all, this trip will give me the chance to reconnect with a friend from high school. In the meantime, we’re layered up and hunkered down! Come on, March! I’m cold! ‘Tis the season! I’ve been invited to read two of my classic children’s books–Alaskan Night Before Christmas and Musher’s Night Before Christmas–at a favorite Anchorage restaurant called Williwaw. It’s at 601 F Street, on the south side of Town Square. 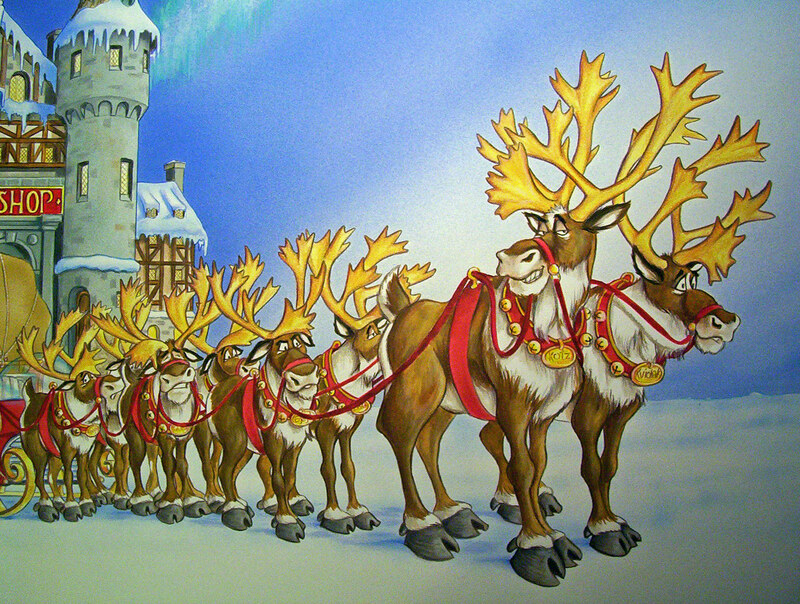 On Friday evening, November 25, the annual AT&T Tree Lighting event will draw hundreds of kids and their families to the Town Square for carols, Santa’s arrival, and the flip of a switch to light the tree. It’s simple–just pop across the street to SteamDot and Williwaw, and you can warm up with coffee, hot chocolate (free for kids under 12), a snack, and my reading. I’ll be on the Williwaw stage projecting the book’s artwork, which is timed for the “pages” to turn as I read. 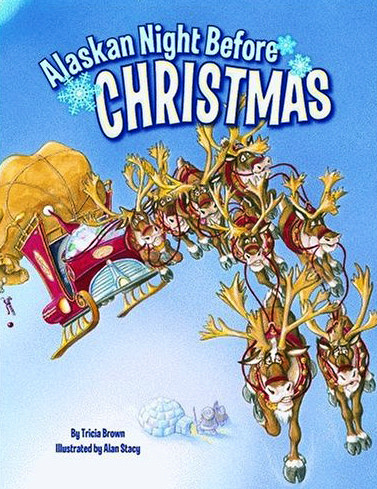 Come for the 5 p.m. reading of Alaskan Night Before Christmas, followed by Musher’s Night Before Christmas at 5:30, and a repeat of the two books at 6 and 6:30 p.m.
We’ll have a supply of both books on hand and will be ready to personalize one for your favorite kid or the whole family. Drop by! Hey! It’s almost time for Trick-or-Treat Street in downtown Anchorage! If you’re headed down on Saturday, Oct. 29, be sure to swing by the 4th Avenue Market Place, where I’ll be reading my children’s books and showing movies of illustrations. I’ll be reading every twenty minutes or so from noon to 4:00 p.m. in the Port View Room. Come and find me. I’ll be in a scarecrow costume that I made myself! I grew up in a time when door-to-door trick-or-treating was one of the social highlights of a kid’s year. I’m so old that I watched It’s the Great Pumpkin, Charlie Brown when it was new! With help from our creative Mom, we came up with our own costumes–like “witch,” or “hobo,” or “ghost” (note the absence of Disney-copyrighted characters)–and held out pillowcases for goodies. Afterward, my brother and I dumped out our takes on the living room carpet and negotiated trades. Some mothers actually made and wrapped cupcakes, caramel apples, or popcorn balls. And they were not only safe for consumption, they were delicious. The whole neighborhood was lit up for the lanes of foot traffic. It really was that heady and innocent and fun. Join the Alaska MS Center for their annual zombie flash mob, goodies, and more! Free Kid-sized Hot Chocolate for kids in costume! Yes, I’ll have copies of all my books available for purchase, too. See you there! Here’s a link for more info and maps: Trick-or-Treat Street!